Digital publishing company Mygazines launched its iPad Edition , a browser-based mobile reading system for Apple’s tablet device. It is not an iPad App but a universal e-reading technology that works on any touch screen device (this list also includes the iphone, ipod touch and the Android Phone). Some interesting user sentiment analysis about the iPad. According to a study by Attensity some of the top liked features are: the applications, the device’s ability to replace the iPhone and the keyboard experience. They have also indicated that more and more people are talking about the Kindle-killer and the email interface today. 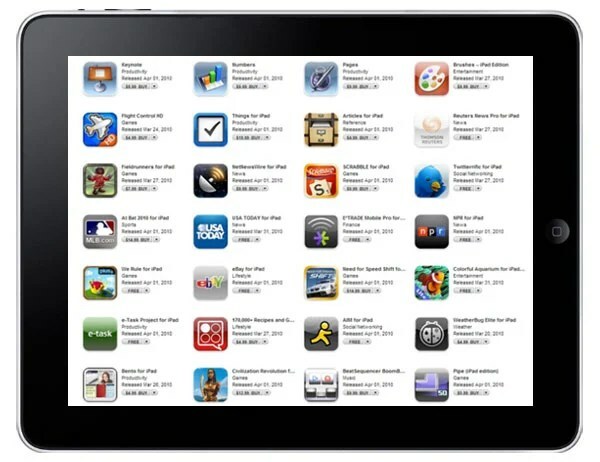 Mobclix says the average price of apps is $4.99; and it will cost $12,572.78 to buy all the apps that the store offers. 2) iWork – MS Office and email: One of the cool features is that if you email yourself a Word doc, you can open it in pages. 3) The Kindle reader works great on the iPad: For users who have used the Kindle store in the past the iPad app for Kindle works great. 4) Desktop Document: In order to use iWork documents on iPad users will have to either import the documents in iTunes or email the documents to themselves.